My route to the best burger around from my job at A.M. Davison's was through Smith-Bridgman's front door, out the back door, across the alley, and through the Smith-B's annex. JBing50 mentioned Shelly at the counter. (I never would have remembered his name, John, but I can still see and hear him!) No one who ate at Kewpee's could ever forget his gruff voice shouting out the orders and calculating the cost. "That will be $250.00, young man." Which, of course, translated to $2.50. A classic Flint character he was. Someone told me his name was Shelly & he was the brother of Bill Thomas. He was definitely a character!!! My cravings for a double with ketchup and olives only and a Boston cooler come at the precise frequency as those I have for 2 up with onions from Angelo's. Funny, Big John's just never took hold like that. If it can be said that a building is lovable, I truly cherished the old location downtown (no, not the one in the pic ... if unclebuck doesn't remember it, I sure as heck don't) ... the old tile on the exterior, the smells, the sullen old panhandler who always sat in the same booth every morning and griped about the coffee, the Vernor's mural. It made Flint special for a young kid ... no place else like it anywhere. For olfactory delight, it was rivaled for me only by Paul's Pipe Shop, the warm peanuts at Sears at Robert T. and Saginaw and Schafer's Drums (yeah, I loved that new drum smell and the mildly musty carpet in that joint). Maybe unclebuck can be prevailed upon to tell us about the "wound weenies on a woasted bun" at The Varsity some time, hmmm? Sure, unclebuck ... your sister-in-law said they were heavenly ... and, as you know, she didn't throw that word around lightly. There is one Kewpee's in Racine and a few in Ohio and that is it. Check out this link and you will see a old photo of a Lansing MI Kewpee's and the current one in Racine WI. There used to be 2 Lansing MI Kewpee's...I wonder which one this portrays? Anyone know out there?? check out this book by David G. Hogan "Selling 'em by the sack"
There is alot of info on Kewpee's there. I'll have a deluxe with heavy olives, Shelly! That's exactly what I did most days for lunch during the four years I worked at the Flint Journal. Kewpee's main offices used to be in Toledo, Ohio. Now they are in Lima. Three larger locations are here with the original smaller one downtown. The one in Flint on Harrison Street was the best. And they used to heat their buns. They no longer do that here. And the taste has changed from the old days too. I worked at the Capitol theater and we wouldn't allow Kewpees into the theater. The onion smell was overwhelming-smile! OMG...I used to work there in 76! Lots of info on Kewpee there including the fact it at one point had 400 locations and was the 2nd chain of hamburger restuarants. That was the East Lansing Kewpees from back in the 1940's. There is a Barnes & Noble there now. 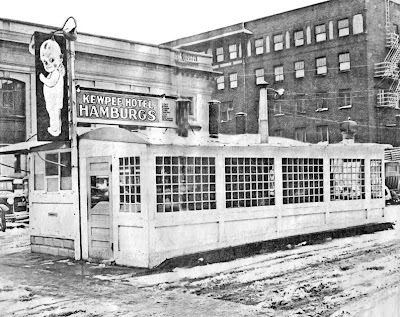 The downtown Lansing Kewpees is still open though in a different location. They have a website www.kewpees.com and a facebook fan page. The Kewpee on Harrison was "little Kewpee" and the one off Court and Saginaw was "Big Kewpee." Shelly knew everybody. He was Bill Thomas' brother and Terry Thomas' uncle. The only problem with little Kewpee is there wasn't enough parking. Everybody who worked in the stores downtown ate lunch there.